With the Del Mar and Saratoga meets scheduled to begin next week, this coming weekend is essentially the "calm before the storm" of top-class racing just around the corner. However, that doesn't mean that this weekend is lacking in excitement, for there are several notable graded stakes races on the schedule, including the $500,000 Indiana Derby (gr. III) and the $200,000 Los Alamitos Derby (gr. III). 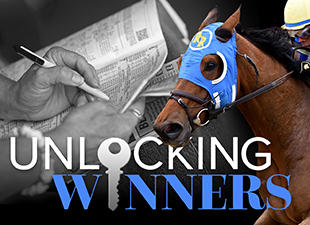 Both races have drawn competitive fields with plenty of contenders-let's start handicapping! Eight of California's best up-and-coming three-year-olds have turned out to contest this nine-furlong race, with West Coast looming as a heavy favorite. Trained by Bob Baffert, the son of Flatter hasn't finished out of the exacta in five starts, including a decisive 3 ¾-length romp in the 8.5-furlong Easy Goer Stakes at Belmont Park, for which he earned an eye-catching 99 Beyer speed figure. That effort came two starts after West Coast ran a huge race in the Lexington Stakes (gr. III) at Keeneland, making an early move into a fast pace before losing by just a head to the late-running Senior Investment. Baffert has taken his time with West Coast, even though he had initially viewed him as a Belmont Stakes contender, and that patience seems to be paying off. I don't think West Coast will have any trouble handling nine furlongs, and he's got enough tactical speed to stay close to the lead if necessary in a race that doesn't appear to have a ton of pace on paper. He'll be a short price, but I believe West Coast is a talented colt that could be a legitimate contender for the Travers Stakes (gr. I) next month, and the Los Alamitos Derby looks like another ideal stepping stone toward greater achievements in the future. To round out the exacta, I would take a close look at Cistron. Although he's been campaigned primarily on turf thus far, with a third-place finish in the Penn Mile (gr. II) among his best efforts, his lone start in a dirt route yielded a gate-to-wire win in the 8.5-furlong Northern Spur Stakes at Oaklawn Park. Trained by John Sadler, Cistron has a lot of early speed and figures to set the pace in the Los Alamitos Derby, and from there he should be perfectly positioned for a peak effort. Winning the race certainly isn't out of the question. Klimt is also expected to draw wagering attention in his first start since finishing eighth in the 2016 Breeders' Cup Juvenile (gr. I). Trained at the time by Bob Baffert, the Los Alamitos Derby will mark Klimt's first start for trainer Art Sherman, and while the colt is a proven commodity in top-class races-he won the Del Mar Futurity (gr. I) last summer and finished second in the FrontRunner Stakes (gr. I)-I got the impression last year that he was superior sprinting around one turn, so a two-turn graded stakes races could be a tough spot for Klimt to make his first start in eight months. You have to give a lot of credit to Irap, who has risen steadily through the ranks this year to win the Blue Grass Stakes (gr. II) and Ohio Derby (gr. III) while showcasing a remarkable versatility in terms of running style. He has proven very effective racing near the lead or rallying from mid-pack, and if you forgive his somewhat troubled eighteenth-place finish in the Kentucky Derby, his recent form looks exceptional. Still, Irap hasn't been the most consistent runner, and in a fairly deep renewal of the Indiana Derby, I'm not sure that he has much room for error. As the 8-5 favorite on the morning line, I don't think he offers much value, even if he might be the most likely winner. With this in mind, I'm going to take a shot with Hollywood Handsome. Although his two graded stakes efforts to date weren't anything remarkable-a fourth-place finish in the Louisiana Derby (gr. II) and a fifth in the Illinois Derby (gr. III)-I was impressed by his win in an 8.5-furlong allowance race two starts back, in which he rallied into a slow pace to win by a neck with the third-place finisher nine lengths behind. Better still, Hollywood Handsome ran his final five-sixteenths of a mile in just over :30 seconds, an impressive time for a dirt race regardless of the slow early pace. Most recently, Hollywood Handsome was unable to finish the Belmont Stakes (gr. I) after he clipped heels going into the first turn, causing jockey Florent Geroux to lose his stirrups. Fortunately, the colt bounced out of the race well and has turned in three solid workouts at Churchill Downs in preparation for the Indiana Derby. He'll need to take another step forward, but if he goes off at his morning line price of 8-1, I think he's worth a play. Untrapped is another to consider after finishing a good third behind Irap in the Ohio Derby. Earlier this year, the Steve Asmussen-trained runner hit the board in the Risen Star Stakes (gr. II), and Rebel Stakes (gr. II) going a mile and a sixteenth, and the slight cutback in distance from the Ohio Derby could be ideal for a colt that might prove best as a miler. In the event that Irap doesn't fire his best shot, Untrapped could be the main beneficiary. Now it's your turn! Who do you like in the weekend stakes races?